2012 - "8/13/2012: “Awww Yeah, Son” – Raindate Twin-30s won by Chris & Ran +YouTube"
The race was originally scheduled to be a 30-Lap feature, but with a potential rainshower on the horizon, we had to be open to a potential rain-out. Randy Platt worked his way through the filed into the lead; having to chase down a very fast Billy Ruggio early. But after lap 10 was completed, the rain came. Hard. Rapid Randy Platt, with Matt and Chris on his tail before the yellow flew, were directed into the pits by starter Wesley James TrOgre Stevens to wait and see if it’d let up. But it didn’t. The race was then postponed for the next day, Monday the 13th. Except when Monday came – this time with Joe Sereno but without Bill Ruggio and Adam Lytle (who both could not make it) – everybody in attendence unanimously voted to turn the10-lap race into a finalized heat and then start an all-new race (with Bill and Adam already qualified into the event and scored in it, but unable to start). All year the racing has been excellent, and this again was no exception. But AGAIN… Randy Platt dispatched a few 1st-year drivers to take a convincing lead. And again Chris and Matt Stevens followed him shortly thereafter. But while in the lead, the #187’s brake broke, and needed repairs to continue. Platt then hopped into the Galletta’s #2 (and even took a ride into Rungnapha “Aou”‘s garden – see victory pic). This put the club’s founding brothers (and the two most experienced karters in Oswego County racing for twenty years now) in the lead for another of their famous battles. Matt pulled alongsside his brother several times, and a few laps came close to being ties! But Chris held him off. Not by much, as we see an excellent closeup of the finish – the #4 getting the #3 by a kart nose. Man, we’ve been having a LOT of Twin-30s this season. Everybody loves them, especially since it seems that we get a far more varied winners list, and longer races tend to favor the little tricky master-of-the-low-groove-passer Matt. Let’s see if that trend continues, no? Randinator Bobandnator Randy Platt again charged his Platt-Num #187 into the front, looking for that elusive 2012 Feature win. However, again he started having problems, as the hip bar broke (in a Galletta’s Kart, the left hip rests on a padded bar that allows you to control the feel if the kart. When it breaks, you are holding on for dear life… and it is quite a hard workout to hold onto a kart going 50mph for 30 laps. This allowed Eric Woolworth to stay within shouting distance and give Randy a run for the money. Not that we have money. Just a saying. Here is a great battle late in the race between Chris Stevens (outside in his Chrusher.com #74), Joe Sereno (middle in the Galletta’s Greenhouse #5), and Matt Stevens (in his wife’s #80) on the inside. Chris lost this encounter, as Matt and Joe pinched him into the brush at the end of the back stretch, where he hit something hard enough to bend his sprocket. He then hopped back into the Galletta’s #4 for the rest of the race. Randy took it by over a kart length despite his hip bar problems, but behind him the battles were competitive and fun to watch (and race in). Close finish for 4th here. In fact, too close to call, even after viewing slow motion replays and freeze-frames on the tape. To some, it looked like Brian got Matt, but Matt insisted he thought he got him. It’s just too close to call. 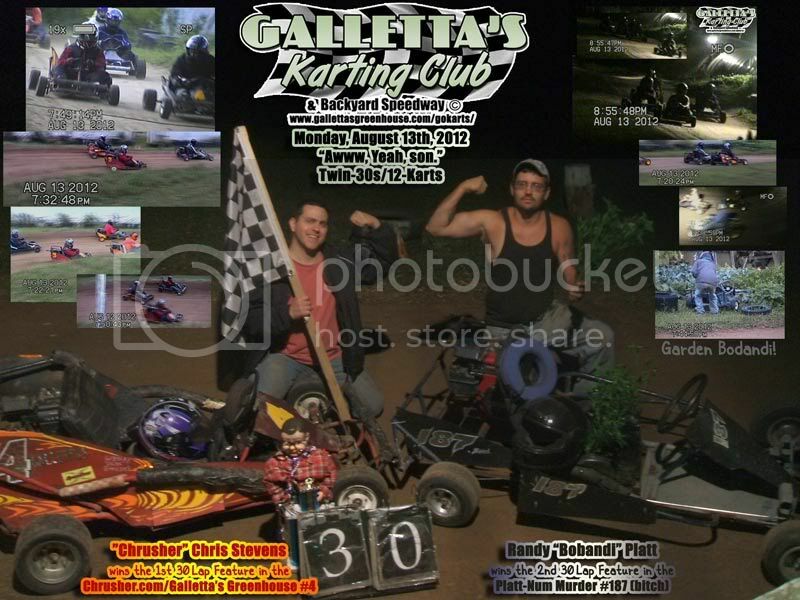 We awarded it a tie between Brian Galletta and Matt Stevens. I believe Matt has more ties than every other competitor in our history combined, as he always goes for that last-lap slingshot almost every finish.